"Nucleogenesis" redirects here. For the song by Vangelis, see Albedo 0.39. Nucleosynthesis is the process that creates new atomic nuclei from pre-existing nucleons, primarily protons and neutrons. The first nuclei were formed about three minutes after the Big Bang, through the process called Big Bang nucleosynthesis. Seventeen minutes later the universe had cooled to a point at which these processes ended, so only the fastest and simplest reactions occurred, leaving our universe containing about 75% hydrogen, 24% helium, and traces of other elements such as lithium and the hydrogen isotope deuterium. The universe still has approximately the same composition today. Heavier nuclei were created from these, by several processes. Stars formed, and began to fuse light elements to heavier ones in their cores, giving off energy in the process, known as stellar nucleosynthesis. Fusion processes create many of the lighter elements up to and including iron and nickel, and these elements are ejected into space (the interstellar medium) when smaller stars shed their outer envelopes and become smaller stars known as white dwarfs. The remains of their ejected mass form the planetary nebulae observable throughout our galaxy. Supernova nucleosynthesis within exploding stars by fusing carbon and oxygen is responsible for the abundances of elements between magnesium (atomic number 12) and nickel (atomic number 28). Supernova nucleosynthesis is also thought to be responsible for the creation of rarer elements heavier than iron and nickel, in the last few seconds of a type II supernova event. The synthesis of these heavier elements absorbs energy (endothermic process) as they are created, from the energy produced during the supernova explosion. Some of those elements are created from the absorption of multiple neutrons (the r-process) in the period of a few seconds during the explosion. 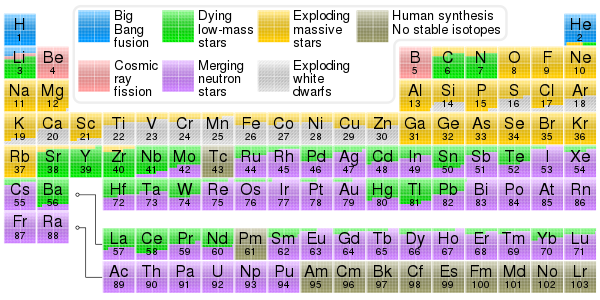 The elements formed in supernovas include the heaviest elements known, such as the long-lived elements uranium and thorium. Neutron star mergers and collisions are also very responsible for many heavy elements, via the r-process ("r" stands for "rapid"). Neutron stars are extremely dense remnants of supernovae, and as their name suggests, they consist of a complex state of matter, predominantly made of tightly packed neutrons. When two such dense stars collide, a large amount of neutron-rich matter may be ejected at extremely high temperatures and under exotic conditions, and heavy elements may form as the ejecta begins to cool. In 2017, the merger of GW170817 led to the detection of substantial signatures of gold, platinum and other heavy elements over an extended period. Cosmic ray spallation, caused when cosmic rays impact the interstellar medium and fragment larger atomic species, is a significant source of the lighter nuclei, particularly 3He, 9Be and 10,11B, that are not created by stellar nucleosynthesis. In addition to the fusion processes responsible for the growing abundances of elements in the universe, a few minor natural processes continue to produce very small numbers of new nuclides on Earth. These nuclides contribute little to their abundances, but may account for the presence of specific new nuclei. These nuclides are produced via radiogenesis (decay) of long-lived, heavy, primordial radionuclides such as uranium and thorium. Cosmic ray bombardment of elements on Earth also contribute to the presence of rare, short-lived atomic species called cosmogenic nuclides. Periodic table showing the cosmogenic origin of each element. Elements from carbon up to sulfur may be made in small stars by the alpha process. Elements beyond iron are made in large stars with slow neutron capture (s-process), followed by expulsion to space in gas ejections (see planetary nebulae). Elements heavier than iron may be made in neutron star mergers or supernovae after the r-process, involving a dense burst of neutrons and rapid capture by the element. It is thought that the primordial nucleons themselves were formed from the quark–gluon plasma during the Big Bang as it cooled below two trillion degrees. A few minutes afterward, starting with only protons and neutrons, nuclei up to lithium and beryllium (both with mass number 7) were formed, but the abundances of other elements dropped sharply with growing atomic mass. Some boron may have been formed at this time, but the process stopped before significant carbon could be formed, as this element requires a far higher product of helium density and time than were present in the short nucleosynthesis period of the Big Bang. That fusion process essentially shut down at about 20 minutes, due to drops in temperature and density as the universe continued to expand. This first process, Big Bang nucleosynthesis, was the first type of nucleogenesis to occur in the universe. The subsequent nucleosynthesis of the heavier elements requires the extreme temperatures and pressures found within stars and supernovas. These processes began as hydrogen and helium from the Big Bang collapsed into the first stars at 500 million years. Star formation has occurred continuously in galaxies since that time. Among the elements found naturally on Earth (the so-called primordial elements), those heavier than boron were created by stellar nucleosynthesis and by supernova nucleosynthesis. They range in atomic numbers from Z=6 (carbon) to Z=94 (plutonium). Synthesis of these elements occurred either by nuclear fusion (including both rapid and slow multiple neutron capture) or to a lesser degree by nuclear fission followed by beta decay. A star gains heavier elements by combining its lighter nuclei, hydrogen, deuterium, beryllium, lithium, and boron, which were found in the initial composition of the interstellar medium and hence the star. Interstellar gas therefore contains declining abundances of these light elements, which are present only by virtue of their nucleosynthesis during the Big Bang. Larger quantities of these lighter elements in the present universe are therefore thought to have been restored through billions of years of cosmic ray (mostly high-energy proton) mediated breakup of heavier elements in interstellar gas and dust. The fragments of these cosmic-ray collisions include the light elements Li, Be and B. The first ideas on nucleosynthesis were simply that the chemical elements were created at the beginning of the universe, but no rational physical scenario for this could be identified. Gradually it became clear that hydrogen and helium are much more abundant than any of the other elements. All the rest constitute less than 2% of the mass of the Solar System, and of other star systems as well. At the same time it was clear that oxygen and carbon were the next two most common elements, and also that there was a general trend toward high abundance of the light elements, especially those composed of whole numbers of helium-4 nuclei. Arthur Stanley Eddington first suggested in 1920, that stars obtain their energy by fusing hydrogen into helium and raised the possibility that the heavier elements may also form in stars. This idea was not generally accepted, as the nuclear mechanism was not understood. In the years immediately before World War II, Hans Bethe first elucidated those nuclear mechanisms by which hydrogen is fused into helium. Fred Hoyle's original work on nucleosynthesis of heavier elements in stars, occurred just after World War II. His work explained the production of all heavier elements, starting from hydrogen. Hoyle proposed that hydrogen is continuously created in the universe from vacuum and energy, without need for universal beginning. Hoyle's work explained how the abundances of the elements increased with time as the galaxy aged. Subsequently, Hoyle's picture was expanded during the 1960s by contributions from William A. Fowler, Alastair G. W. Cameron, and Donald D. Clayton, followed by many others. The seminal 1957 review paper by E. M. Burbidge, G. R. Burbidge, Fowler and Hoyle is a well-known summary of the state of the field in 1957. That paper defined new processes for the transformation of one heavy nucleus into others within stars, processes that could be documented by astronomers. The Big Bang itself had been proposed in 1931, long before this period, by Georges Lemaître, a Belgian physicist, who suggested that the evident expansion of the Universe in time required that the Universe, if contracted backwards in time, would continue to do so until it could contract no further. This would bring all the mass of the Universe to a single point, a "primeval atom", to a state before which time and space did not exist. Hoyle later gave Lemaître's model the derisive term of Big Bang, not realizing that Lemaître's model was needed to explain the existence of deuterium and nuclides between helium and carbon, as well as the fundamentally high amount of helium present, not only in stars but also in interstellar space. As it happened, both Lemaître and Hoyle's models of nucleosynthesis would be needed to explain the elemental abundances in the universe. The goal of the theory of nucleosynthesis is to explain the vastly differing abundances of the chemical elements and their several isotopes from the perspective of natural processes. The primary stimulus to the development of this theory was the shape of a plot of the abundances versus the atomic number of the elements. Those abundances, when plotted on a graph as a function of atomic number, have a jagged sawtooth structure that varies by factors up to ten million. A very influential stimulus to nucleosynthesis research was an abundance table created by Hans Suess and Harold Urey that was based on the unfractionated abundances of the non-volatile elements found within unevolved meteorites. Such a graph of the abundances is displayed on a logarithmic scale below, where the dramatically jagged structure is visually suppressed by the many powers of ten spanned in the vertical scale of this graph. See Handbook of Isotopes in the Cosmos for more data and discussion of abundances of the isotopes. Abundances of the chemical elements in the Solar System. Hydrogen and helium are most common, residuals within the paradigm of the Big Bang. The next three elements (Li, Be, B) are rare because they are poorly synthesized in the Big Bang and also in stars. The two general trends in the remaining stellar-produced elements are: (1) an alternation of abundance of elements according to whether they have even or odd atomic numbers, and (2) a general decrease in abundance, as elements become heavier. Within this trend is a peak at abundances of iron and nickel, which is especially visible on a logarithmic graph spanning fewer powers of ten, say between logA=2 (A=100) and logA=6 (A=1,000,000). There are a number of astrophysical processes which are believed to be responsible for nucleosynthesis. The majority of these occur in within stars, and the chain of those nuclear fusion processes are known as hydrogen burning (via the proton-proton chain or the CNO cycle), helium burning, carbon burning, neon burning, oxygen burning and silicon burning. These processes are able to create elements up to and including iron and nickel. This is the region of nucleosynthesis within which the isotopes with the highest binding energy per nucleon are created. Heavier elements can be assembled within stars by a neutron capture process known as the s-process or in explosive environments, such as supernovae and neutron star mergers, by a number of other processes. Some of those others include the r-process, which involves rapid neutron captures, the rp-process, and the p-process (sometimes known as the gamma process), which results in the photodisintegration of existing nuclei. Big Bang nucleosynthesis occurred within the first three minutes of the beginning of the universe and is responsible for much of the abundance of 1H (protium), 2H (D, deuterium), 3He (helium-3), and 4He (helium-4). Although 4He continues to be produced by stellar fusion and alpha decays and trace amounts of 1H continue to be produced by spallation and certain types of radioactive decay, most of the mass of the isotopes in the universe are thought to have been produced in the Big Bang. The nuclei of these elements, along with some 7Li and 7Be are considered to have been formed between 100 and 300 seconds after the Big Bang when the primordial quark–gluon plasma froze out to form protons and neutrons. Because of the very short period in which nucleosynthesis occurred before it was stopped by expansion and cooling (about 20 minutes), no elements heavier than beryllium (or possibly boron) could be formed. Elements formed during this time were in the plasma state, and did not cool to the state of neutral atoms until much later. Stellar nucleosynthesis is the nuclear process by which new nuclei are produced. It occurs in stars during stellar evolution. It is responsible for the galactic abundances of elements from carbon to iron. Stars are thermonuclear furnaces in which H and He are fused into heavier nuclei by increasingly high temperatures as the composition of the core evolves. Of particular importance is carbon because its formation from He is a bottleneck in the entire process. Carbon is produced by the triple-alpha process in all stars. Carbon is also the main element that causes the release of free neutrons within stars, giving rise to the s-process, in which the slow absorption of neutrons converts iron into elements heavier than iron and nickel. The products of stellar nucleosynthesis are generally dispersed into the interstellar gas through mass loss episodes and the stellar winds of low mass stars. The mass loss events can be witnessed today in the planetary nebulae phase of low-mass star evolution, and the explosive ending of stars, called supernovae, of those with more than eight times the mass of the Sun. The first direct proof that nucleosynthesis occurs in stars was the astronomical observation that interstellar gas has become enriched with heavy elements as time passed. As a result, stars that were born from it late in the galaxy, formed with much higher initial heavy element abundances than those that had formed earlier. The detection of technetium in the atmosphere of a red giant star in 1952, by spectroscopy, provided the first evidence of nuclear activity within stars. Because technetium is radioactive, with a half-life much less than the age of the star, its abundance must reflect its recent creation within that star. Equally convincing evidence of the stellar origin of heavy elements is the large overabundances of specific stable elements found in stellar atmospheres of asymptotic giant branch stars. Observation of barium abundances some 20-50 times greater than found in unevolved stars is evidence of the operation of the s-process within such stars. Many modern proofs of stellar nucleosynthesis are provided by the isotopic compositions of stardust, solid grains that have condensed from the gases of individual stars and which have been extracted from meteorites. Stardust is one component of cosmic dust and is frequently called presolar grains. The measured isotopic compositions in stardust grains demonstrate many aspects of nucleosynthesis within the stars from which the grains condensed during the star's late-life mass-loss episodes. Supernova nucleosynthesis occurs in the energetic environment in supernovae, in which the elements between silicon and nickel are synthesized in quasiequilibrium established during fast fusion that attaches by reciprocating balanced nuclear reactions to 28Si. Quasiequilibrium can be thought of as almost equilibrium except for a high abundance of the 28Si nuclei in the feverishly burning mix. This concept was the most important discovery in nucleosynthesis theory of the intermediate-mass elements since Hoyle's 1954 paper because it provided an overarching understanding of the abundant and chemically important elements between silicon (A=28) and nickel (A=60). It replaced the incorrect although much cited alpha process of the B2FH paper, which inadvertently obscured Hoyle's 1954 theory. Further nucleosynthesis processes can occur, in particular the r-process (rapid process) described by the B2FH paper and first calculated by Seeger, Fowler and Clayton, in which the most neutron-rich isotopes of elements heavier than nickel are produced by rapid absorption of free neutrons. The creation of free neutrons by electron capture during the rapid compression of the supernova core along with the assembly of some neutron-rich seed nuclei makes the r-process a primary process, and one that can occur even in a star of pure H and He. This is in contrast to the B2FH designation of the process as a secondary process. This promising scenario, though generally supported by supernova experts, has yet to achieve a satisfactory calculation of r-process abundances. The primary r-process has been confirmed by astronomers who had observed old stars born when galactic metallicity was still small, that nonetheless contain their complement of r-process nuclei; thereby demonstrating that the metallicity is a product of an internal process. The r-process is responsible for our natural cohort of radioactive elements, such as uranium and thorium, as well as the most neutron-rich isotopes of each heavy element. The rp-process (rapid proton) involves the rapid absorption of free protons as well as neutrons, but its role and its existence are less certain. Explosive nucleosynthesis occurs too rapidly for radioactive decay to decrease the number of neutrons, so that many abundant isotopes with equal and even numbers of protons and neutrons are synthesized by the silicon quasi-equilibrium process. During this process, the burning of oxygen and silicon fuses nuclei that themselves have equal numbers of protons and neutrons to produce nuclides which consist of whole numbers of helium nuclei, up to 15 (representing 60Ni). Such multiple-alpha-particle nuclides are totally stable up to 40Ca (made of 10 helium nuclei), but heavier nuclei with equal and even numbers of protons and neutrons are tightly bound but unstable. The quasi-equilibrium produces radioactive isobars 44Ti, 48Cr, 52Fe, and 56Ni, which (except 44Ti) are created in abundance but decay after the explosion and leave the most stable isotope of the corresponding element at the same atomic weight. The most abundant and extant isotopes of elements produced in this way are 48Ti, 52Cr, and 56Fe. These decays are accompanied by the emission of gamma-rays (radiation from the nucleus), whose spectroscopic lines can be used to identify the isotope created by the decay. The detection of these emission lines were an important early product of gamma-ray astronomy. The most convincing proof of explosive nucleosynthesis in supernovae occurred in 1987 when those gamma-ray lines were detected emerging from supernova 1987A. Gamma-ray lines identifying 56Co and 57Co nuclei, whose radioactive half-lives limit their age to about a year, proved that their radioactive cobalt parents created them. This nuclear astronomy observation was predicted in 1969 as a way to confirm explosive nucleosynthesis of the elements, and that prediction played an important role in the planning for NASA's Compton Gamma-Ray Observatory. Other proofs of explosive nucleosynthesis are found within the stardust grains that condensed within the interiors of supernovae as they expanded and cooled. Stardust grains are one component of cosmic dust. In particular, radioactive 44Ti was measured to be very abundant within supernova stardust grains at the time they condensed during the supernova expansion. This confirmed a 1975 prediction of the identification of supernova stardust (SUNOCONs), which became part of the pantheon of presolar grains. Other unusual isotopic ratios within these grains reveal many specific aspects of explosive nucleosynthesis. Neutron star collisions are believed to be the main source of r-process elements. Being neutron-rich by definition, this has been suspected of being a source of such elements, but definitive evidence was difficult to obtain. In 2017 strong evidence emerged, when LIGO, VIRGO, the Fermi Gamma-ray Space Telescope and INTEGRAL, along with a collaboration of many observatories around the world, detected both gravitational wave and electromagnetic signatures of a likely neutron star collision, GW170817, and subsequently detected signals of numerous heavy elements such as gold as the ejected material began to cool. Nucleosynthesis may happen in accretion disks of black holes. are thought to have been produced in the Big Bang. The spallation process results from the impact of cosmic rays (mostly fast protons) against the interstellar medium. These impacts fragment carbon, nitrogen, and oxygen nuclei present. The process results in the light elements beryllium, boron, and lithium in the cosmos at much greater abundances than they are found within solar atmospheres. The quantities of the light elements 1H and 4He produced by spallation are negligible relative to their primordial abundance. Beryllium and boron are not significantly produced by stellar fusion processes, since 8Be is not particle-bound. Theories of nucleosynthesis are tested by calculating isotope abundances and comparing those results with observed abundances. Isotope abundances are typically calculated from the transition rates between isotopes in a network. Often these calculations can be simplified as a few key reactions control the rate of other reactions. Tiny amounts of certain nuclides are produced on Earth by artificial means. Those are our primary source, for example, of technetium. However, some nuclides are also produced by a number of natural means that have continued after primordial elements were in place. These often act to create new elements in ways that can be used to date rocks or to trace the source of geological processes. Although these processes do not produce the nuclides in abundance, they are assumed to be the entire source of the existing natural supply of those nuclides. Radioactive decay may lead to radiogenic daughter nuclides. The nuclear decay of many long-lived primordial isotopes, especially uranium-235, uranium-238, and thorium-232 produce many intermediate daughter nuclides before they too finally decay to isotopes of lead. The Earth's natural supply of elements like radon and polonium is via this mechanism. The atmosphere's supply of argon-40 is due mostly to the radioactive decay of potassium-40 in the time since the formation of the Earth. Little of the atmospheric argon is primordial. Helium-4 is produced by alpha-decay, and the helium trapped in Earth's crust is also mostly non-primordial. In other types of radioactive decay, such as cluster decay, larger species of nuclei are ejected (for example, neon-20), and these eventually become newly formed stable atoms. Radioactive decay may lead to spontaneous fission. This is not cluster decay, as the fission products may be split among nearly any type of atom. Thorium-232, uranium-235, and uranium-238 are primordial isotopes that undergo spontaneous fission. Natural technetium and promethium are produced in this manner. Nuclear reactions. Naturally-occurring nuclear reactions powered by radioactive decay give rise to so-called nucleogenic nuclides. This process happens when an energetic particle from radioactive decay, often an alpha particle, reacts with a nucleus of another atom to change the nucleus into another nuclide. This process may also cause the production of further subatomic particles, such as neutrons. Neutrons can also be produced in spontaneous fission and by neutron emission. These neutrons can then go on to produce other nuclides via neutron-induced fission, or by neutron capture. For example, some stable isotopes such as neon-21 and neon-22 are produced by several routes of nucleogenic synthesis, and thus only part of their abundance is primordial. Nuclear reactions due to cosmic rays. By convention, these reaction-products are not termed "nucleogenic" nuclides, but rather cosmogenic nuclides. Cosmic rays continue to produce new elements on Earth by the same cosmogenic processes discussed above that produce primordial beryllium and boron. One important example is carbon-14, produced from nitrogen-14 in the atmosphere by cosmic rays. Iodine-129 is another example. ^ a b Clayton, D. D. (2003). Handbook of Isotopes in the Cosmos. Cambridge, UK: Cambridge University Press. ISBN 978-0-521-82381-4. ^ Eddington, A. S. (1920). "The Internal Constitution of the Stars". Nature. 106 (2653): 14–20. Bibcode:1920Natur.106...14E. doi:10.1038/106014a0. ^ Suess, Hans E.; Urey, Harold C. (1956). "Abundances of the Elements". Reviews of Modern Physics. 28 (1): 53–74. Bibcode:1956RvMP...28...53S. doi:10.1103/RevModPhys.28.53. ^ Stiavelli, Massimo (2009). From First Light to Reionization the End of the Dark Ages. Weinheim, Germany: Wiley-VCH. p. 8. ISBN 9783527627370. ^ Clayton, D. D. (1983). Principles of Stellar Evolution and Nucleosynthesis (Reprint ed.). Chicago, USA: University of Chicago Press. Chapter 5. ISBN 978-0-226-10952-7. ^ a b Clayton, D. D. (1983). Principles of Stellar Evolution and Nucleosynthesis (Reprint ed.). Chicago, USA: University of Chicago Press. Chapter 7. ISBN 978-0-226-10952-7. ^ Merrill, S. P. W. (1952). "Spectroscopic Observations of Stars of Class". The Astrophysical Journal. 116: 21. Bibcode:1952ApJ...116...21M. doi:10.1086/145589. ^ a b Bodansky, D.; Clayton, D. D.; Fowler, W. A. (1968). "Nuclear Quasi-Equilibrium during Silicon Burning". The Astrophysical Journal Supplement Series. 16: 299. Bibcode:1968ApJS...16..299B. doi:10.1086/190176. ^ Clayton, D. D. (2007). "Hoyle's Equation". Science. 318 (5858): 1876–1877. doi:10.1126/science.1151167. PMID 18096793. ^ Seeger, P. A.; Fowler, W. A.; Clayton, D. D. (1965). "Nucleosynthesis of Heavy Elements by Neutron Capture". The Astrophysical Journal Supplement Series. 11: 121. Bibcode:1965ApJS...11..121S. doi:10.1086/190111. ^ a b Clayton, D. D.; Colgate, S. A.; Fishman, G. J. (1969). "Gamma-Ray Lines from Young Supernova Remnants". The Astrophysical Journal. 155: 75. Bibcode:1969ApJ...155...75C. doi:10.1086/149849. ^ Stromberg, Joseph (16 July 2013). "All the Gold in the Universe Could Come from the Collisions of Neutron Stars". Smithsonian. Retrieved 27 April 2014. ^ Chu, J. (n.d.). "GW170817 Press Release". LIGO/Caltech. Retrieved 2018-07-04. ^ Chakrabarti, S. K.; Jin, L.; Arnett, W. D. (1987). "Nucleosynthesis Inside Thick Accretion Disks Around Black Holes. I - Thermodynamic Conditions and Preliminary Analysis". The Astrophysical Journal. 313: 674. Bibcode:1987ApJ...313..674C. doi:10.1086/165006. OSTI 6468841. ^ McLaughlin, G.; Surman, R. (2 April 2007). "Nucleosynthesis from Black Hole Accretion Disks" (PDF). ^ Frankel, N. (2017). Nucleosynthesis in Accretion Disks Around Black Holes (MSc thesis). Lund Observatory/Lund University. ^ Surman, R.; McLaughlin, G. C.; Ruffert, M.; Janka, H.-Th. ; Hix, W. R. (2008). "Process Nucleosynthesis in Hot Accretion Disk Flows from Black Hole-Neutron Star Mergers". The Astrophysical Journal. 679 (2): L117–L120. arXiv:0803.1785. Bibcode:2008ApJ...679L.117S. doi:10.1086/589507. ^ Arai, K.; Matsuba, R.; Fujimoto, S.; Koike, O.; Hashimoto, M. (2003). "Nucleosynthesis Inside Accretion Disks Around Intermediate-mass Black Holes". Nuclear Physics A. 718: 572–574. Bibcode:2003NuPhA.718..572A. doi:10.1016/S0375-9474(03)00856-X. ^ Mukhopadhyay, B. (2018). "Nucleonsynthesis in Advective Accretion Disk Around Compact Object". In Jantzen, R. T.; Ruffini, R.; Gurzadyan, V. G. (eds.). Proceedings of the Ninth Marcel Grossmann Meeting on General Relavitity. World Scientific. pp. 2261–2262. arXiv:astro-ph/0103162. Bibcode:2002nmgm.meet.2261M. CiteSeerX 10.1.1.254.7490. doi:10.1142/9789812777386_0544. ISBN 9789812389930. ^ Breen, P. G. (2018). "Light element variations in globular clusters via nucleosynthesis in black hole accretion discs". Monthly Notices of the Royal Astronomical Society: Letters. 481: L110–114. arXiv:1804.08877. Bibcode:2018MNRAS.481L.110B. doi:10.1093/mnrasl/sly169. Hoyle, F. (1954). "On Nuclear Reactions Occurring in Very Hot STARS. I. The Synthesis of Elements from Carbon to Nickel". The Astrophysical Journal Supplement Series. 1: 121. Bibcode:1954ApJS....1..121H. doi:10.1086/190005. Burbidge, E. M.; Burbidge, G. R.; Fowler, W. A.; Hoyle, F. (1957). "Synthesis of the Elements in Stars". Reviews of Modern Physics. 29 (4): 547–650. Bibcode:1957RvMP...29..547B. doi:10.1103/RevModPhys.29.547. Meneguzzi, M.; Audouze, J.; Reeves, H. (1971). "The Production of the Elements Li, Be, B by Galactic Cosmic Rays in Space and Its Relation with Stellar Observations". Astronomy and Astrophysics. 15: 337–359. Bibcode:1971A&A....15..337M. Clayton, D. D. (1983). Principles of Stellar Evolution and Nucleosynthesis (Reprint ed.). Chicago, USA: University of Chicago Press. ISBN 978-0-226-10952-7. Clayton, D. D. (2003). Handbook of Isotopes in the Cosmos. Cambridge, UK: Cambridge University Press. ISBN 978-0-521-82381-4. Rolfs, C. E.; Rodney, W. S. (2005). Cauldrons in the Cosmos: Nuclear Astrophysics. Chicago, USA: University of Chicago Press. ISBN 978-0-226-72457-7. Iliadis, C. (2007). Nuclear Physics of Stars. Weinheim, Germany: Wiley-VCH. ISBN 978-3-527-40602-9.